Smart Growth America, a national organization, recently visited Youngstown as part of an initiative on small-scale manufacturing as a placed-based economic development tool. Small-scale manufacturing is an umbrella term for small businesses of up to twenty people producing tangible goods such as textile, hardware, wood, metal, electronics, and 3D printing. It’s closely associated with the Maker Movement and is key to neighborhood-level economic development as it creates local manufacturing jobs. Additionally, it is a tool for redeveloping historic commercial and downtown properties. Youngstown was one of four communities across the United States chosen for this opportunity. 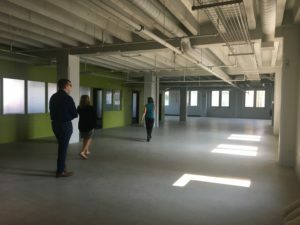 Given its rich manufacturing background and the success of the Youngstown Business Incubator and additive manufacturing technology, the consulting team expressed interest in developing strategies for connecting and increasing the visibility of high technology and innovation to corridors of the distressed city. The Youngstown team was joined by Ilana Preuss, founder of Recast City LLC, a firm that specializes in the real estate needs of entrepreneurs and small manufacturing businesses. Over a three-day period, the team toured local manufacturing companies including original equipment manufacturers and met with property owners, home-based businesses, and the local economic development community. In total over sixty-five interviews were conducted. Following the visit, Recast City LLC will issue a report with recommendations for improving the business climate of makers such as marketing and networking with the manufacturing community to create more business to business opportunities. Additionally, the city will work to streamline policies for live-work spaces and address other real estate gaps such as built-out retail and fabrication space. Eastgate Regional Council of Governments, the Economic Action Group, and the greater economic development community look forward to using these recommendations to grow jobs and increase the vitality of neighborhoods and the downtown.